I received a call from Dennis Jordan a while ago, informing me of the Trimdon Times Website and the section devoted to the Rocking D-Jays along with photographs. Well, after looking at those young lads it brought back so many happy memories, loads of laughs and lots of fun. I was very lucky to have been a part of what I would consider to be one of the finest non professional bands to come out of the North of England. Stretching over three decades they entertained people from all parts of the county, and the founder of all of this was Dennis Jordan. It’s like going down memory lane, here we go straight off the top of my bald head, from the beginning and how it all started. I had known Dennis since school but really formed the friendship when he trained me to take over his paper round when he started work at Purvis. That round was the Foundry, Deaf Hill up to Hoppers Farm and back down to St Aidens Terrace dropping my paper bag back into Jimmy Davison’s Newsagents (bless him), and having a good whiff of frying bacon when I returned on a cold winter’s morning. The pay was 12/6d for six mornings but this was around 1962. 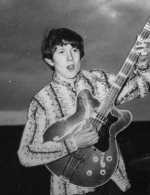 I used to see Dennis at the youth club on a Friday night where we would listen to 45’s by all the stars of the time, such as Del Shannon, Roy Orbison and the Tornadoes and many more on an old record player. We all loved it and of course watching the girls jiving and trying to do it ourselves. One night he brought along his acoustic guitar and a small amplifier about the size of a matchbox and I watched him play those chords so well, I told him how enthusiastic I was about the bass guitar and he mentioned seeing one up for sale at Mervin Hodgsons Shop, Front St, Wingate, a second hand Rosette Solid Bass Guitar. It was Mervin Hodgson, if I remember correctly who managed Freddy and the Mizares, he used to get up onto the stage and play the marackers with his band. I bought the guitar but at the cost of a week’s holiday in a flat at Scarborough, which I had saved for over many months. Dennis and I then embarked on a whole new musical dimension through that matchbox; he had so much patience trying to teach me those three chord numbers, playing bass riffs along to his full chords. We eventually began practising downstairs in the old church institute which was in the graveyard opposite Butcher Greave’s Shop; I remember a lad called Dicky Harmer from Station Town joined us on drums with Dennis on guitar and myself on bass playing the same tune over and over without anyone singing, Lucille, then like a stroke of light out of the blue in walked Johnny Gunn and Teddy Madison. Well it was like having Little Richard there live, bursting into vocals, I think Teddy said he was Johnny’s agent. Johnny was, in my opinion the shining light of the D – Jays, he could sing and cover a full range of notes no matter what the tune. I cannot remember why, but Dicky Harmer decided to leave but again that magic wand worked for us when Brian Quincy joined us to play the drums. Brian’s timing and rhythm on the drums was excellent, no number was a problem to him. Last of all a lad came into the institute one night called Ronnie Davidson asking if he could join us to play rhythm guitar, well that was it there was no stopping us. I am sure that our first gig was in the church institute, I remember Freda, Dennis’s sister making us all turquoise shiny shirts with Johnny in a shiny white shirt for the big occasion. This is where the matchbox amp nearly went into orbit with the bass going through it, I think it was Johnny who said just tie your guitar lead around this table leg on the stage and pretend. I am sure he meant it would sound better. From then on it was practise every Sunday afternoon upstairs in the institute with a small audience watching, great fun. But we could not start until Hughie Darby who called in every Sunday from the colliery club gave us his full singing version of ‘Ramona’ and he did that every Sunday, we would all clap and thank him for calling in. I am sure it was Ronnie and Johnny who on more than one occasion drove around different parts of county Durham getting us bookings at Workingman’s Clubs. We earned £10 for over two hours with an interval in-between for the bingo. (Itchy Coo Powder as just come to mind; now that’s another story). I remember we all chalked on a lot of HP for equipment, a PA system with mikes and an echo chamber plus amplifiers, two Vox AC30’s and new drums. I bought myself a new Hofner Semi Acoustic Bass Guitar and a new table leg on tick. From then onwards we were playing on average, 4 to five nights a week, we were very popular in all the clubs. Billy Walton the builder drove us to our first lot of bookings but he eventually sold his 20 cwt Commer Van to Jacky Luke who took over transporting us with the gear to different gigs. Eventually Jack had to step down as our driver but always remained with us as a staunch supporter. Roberto Santi and his family from little Italy (in Fishburn) then became our driver, who remained with the band for a long time. (Robby, many laughs and again many stories could be told). Around this time Dennis’s brother Alan Jordan became our manager, which we needed because we where so busy, we called him Epstein after the Beatles manager; he took it in good part and helped us a lot. After about six months Johnny began getting really bad throat infections, looking back now he did well to last so long when you think he sang for two hours every night, 4 to 5 nights a week. By this time he was singing all the Beatles latest hits, The Stones, Animals, Them, Wayne Fontana, Searchers, Billy J Kramer & the Dakotas, Jerry Marsden and many more. It was agreed with Epstein that we should all help with the singing during our gigs, by each performing a song. Well, it was like the Muppets, I sang a couple but being tone deaf, it must have sounded terrible, Dennis sang but so high and quiet, like a canary with a bad cold and poor Brian used to sing Do Ah Diddy but always put to many Do Ah Diddy’s in. Ronnie if I remember just would not do it. We would finish up with the giggles which didn’t help. I would say by then it would have been around 1965, lots and lots happening, Bishop Auckland and Peterlee Tech College Christmas dances, Young Farmers Functions at Ovington, Buttonhole, Hutton Magna, Summerhouses and Barnard Castle. Town Hall specials at Spennymoor, Hartlepool and Durham. Big functions supporting The Fernie Mitchell Big Band and lots and lots of worky clubs and pubs. It was decided after much discussion to have auditions in the institute to try and pick another singer for the band. A bit like the X Factor, only being the bunch of lads that we were, it was very difficult to hold our laughter when some of those applicants did their masterpieces. Then this lad from Thornley started and we all looked at each other and realised this is the man, Brent Moore a good all round chanter who would help Johnny with the amount of singing and harmonising to be done. The Nashville Teens line up was born, Brent was so enthusiastic he would even jump into a Sandy Shaw look a like dress to sing, he was really keen. (The oil bell has just come to mind and Brent being abducted from the stage, more stories). During my time with the band I can remember many of our mates coming along with us for a night out and to help with the gear, we could generally squeeze in an extra two or three. The band went from strength to strength performing at lots more new venues and making lots of new friends especially amongst other bands including The Downbeats ( Alan White their drummer who went onto play with John Lennon and the Plastic Yoko Ono Band, The Alan White Band and Yes ), The Styx, The Gringo’s and many more. Our favourite place on a Saturday afternoon for a coffee or a coke and meeting up with other band members and of course the girls was Rossi’s in Newgate Street, Bishop Auckland, I would say my favourite guitarist at that time was Kenny Potts out of the Downbeats, an unbelievable guitarist very talented! Around this time I remember being summoned to the Engineers office at Deaf Hill Colliery and told if I did not spend more time at Technical College and improve my time keeping I would loose my coal board apprenticeship, this would be well into 66, so it was decision time, I decided I had to leave the band. I would not have missed my experiences with the band for all the tea in China. I missed them, the gigs and the laughs for months. But in place of me they got Rob ‘Milky Bar’ Hull one of the finest bass guitarists to come out of the north east, using a Fender Jassmaster, he didn’t need a table leg. When I look back and think of all the times we made all those audiences so happy and the invites we got back for supper and parties oh those parties, well that’s another chapter. • The heart warming experience of knowing we had given a substantial donation after a massive concert at the Miners Welfare Hall, Deaf Hill for The Aberfan Children’s Disaster Fund. • The Tyne Tees Television and Northern Echo, North East Group Competition. After weeks and weeks of groups performing in knock out competitions all around the north east the semi finals and the grand final where held in the Mayfair Ballroom, Newcastle and fully recorded by TTT (wonder if it’s still in their archives) guess who finished in the finals? On that night we must have had a convoy of TMS buses full of supporters from all the Trimdons and villages all around, driving up the A1 to the Mayfair. We came fourth with a promise of a tour of Europe but we all had to be 18 years old and I don’t think any of us were that age. The Renegades came first with The Cherries second, I can’t remember who came third. But a magnificent time had by all, people talked about it for weeks. • Winning the Hartlepool Evening Mail Group Competition, the grand final held at Hartlepool Rink. That’s us on the stairs in the photograph after winning the final in the Rink Ballroom. Another picture for the papers, aye what it was like to be nearly famous? • Dennis buying the music sheet hot off the press for ‘Cant Buy Me Love’ and practising all day Sunday to kick off with it to a packed house at the Village Workingman’s Club (Labour Club) the following week. • The band organising their first ‘Big Music Special’ at the Comrades Club Deaf Hill, comprising of The Original Trimdon Folk Band, The Tees Valley Jazzmen and the D-Jays to a packed house with lots of people having to stand in the outside reception. They did one or two more in later years. I could go on and on, fantastic times and a privilege for me to have been just a small link in a very long chain in the history of Trimdons Rocking D-Jays. If you have read this far then many thanks, I would love to see another DJ band member write Chapter 2.